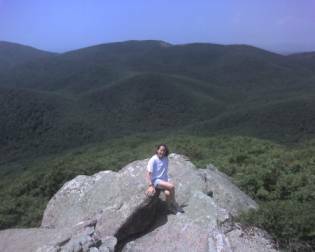 My spouse decides that an excellent way to enjoy her birthday is to hike the western Virginia mountains with her family. So we pile in the car, and drive west. Along the way, she makes the executive decision that we head for a trail head we have come to previously. But this time, instead of Cole Mountain, we will set out for the six-mile Mount Pleasant loop, which starts from the same trail head. In front of us is a 1,400-foot elevation gain. The trail to the Mount Pleasant summit is delightful. Our path starts off along a mossy, fairly wide corridor. Soft grass and ferns cover the forest floor. In front of us, the scene is gorgeously bathed in sunlight that now streams through the treetops after a brief rain. The route is particularly pleasant because we find peaceful silence all around us, and despite the glorious nature of the trail on this sunny Sunday, we seem to be the only hikers here. We are happy that, unlike others, we have the time, the motivation and the knowledge to be enjoying this experience. 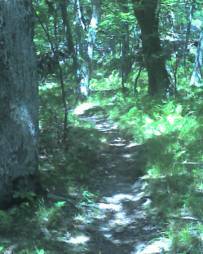 Early on, the trail crosses small, rocky creeks. Low this time of year, as we are two-thirds into the summer. Our puppies happily drink the cool water, as we stop for a lunch break. The air temperature could not be better. The Mount Pleasant National Scenic Area is 7,500 acres in size, and received its designation by Congress in 1994. We walk a short distance and come upon another example of what we have seen previously on this hike: Enormous boulders. We carefully skirt along a very narrow ledge carved into the boulder in front of us, and emerge at the western summit, which puts us at an elevation of 4,070 feet above sea level. In front of us is a breathtaking regional view of the rolling dark green mountains and valleys in all directions around us. We stop to drink in the wonderful views, which are nearly free of all forms of human development. I lead one of our puppies back toward the eastern overlook off of these boulders. My wife follows behind me with our other (naughty) puppy on his leash. Because “Boo Boo” is pulling his leash too earnestly (thereby risking the life of my spouse), she deliberately lets go of the leash and the second puppy joins me. As I stand waiting for her to join me, I hear an unremarkable, seemingly common sound. It is the sound of a high-frequency buzzing. I largely ignore it, as I am convinced it is the all-too-regular sound of crickets. But suddenly, my spouse gets rather agitated and starts shouting. I look up and toward the direction of the buzzing. The buzzing I had been ignoring turns out to be the rattle of an enormous rattlesnake. Only a few feet from my leashed, yet dangerously curious, puppies. I am startled by the sight of what amounts to the largest rattler I’ve ever encountered in the wild, by far. Maybe even larger than any I've seen at a zoo. Reeling wide-eyed, I lurch too fast, loudly yell "JESUS! ", and lose my footing. Fortunately, I have retained hold of the leashes and soon get back on my feet. I quickly, unthinkingly, move a safe distance away with my seemingly oblivious canines. As it turns out, our “Sammy the Snake” encounter has put us face to face with a healthy, adult timber rattlesnake. When we first spot him or her, he is slithering through the rocks and leaves just off our trail. He is fat. Like the barrel end of a large baseball bat. He soon coils up defensively, and is now the shape of a motor vehicle tire. His rattle, announcing to us that we are forbidden to approach closer, has now been steady and loud for several minutes, and continues as we eventually move away. Safely at home later, Wikipedia.com informs me that the timber rattler is about the only rattlesnake found in the northeast US. “Potentially, this is one of North America's most dangerous snakes, due to its long fangs, impressive size and high venom yield. Fortunately, this is to some degree offset by its relatively mild disposition. Before striking,” according to Wikipedia, “they often do a good deal of preliminary rattling and feinting.” Our “Sammy” certainly fits this profile. Unfazed, I cannot resist having a look at what the Eastern Overlook reveals, only a few minutes after our reptile encounter. This overlook is equally impressive and should not be missed. My wife, by this point, is extremely eager to leave the mountain and doesn’t have enough patience to join me at the second overlook. It is an attitude that will, in all likelihood, allow her to live a longer life than her sensation-seeking spouse. Our hike back to the trail head, oddly, is quite a long distance of UPHILL. I remark to Maureen that one would expect a descent from a mountain to be mostly on a DOWNHILL trail. We cross our fingers that we are on a path back to the trail head.